Gigi Lai (黎姿) took a break from her low profile lifestyle and appeared at the Friends For Life 2013 <歲月友情演唱會> concert on November 10. Rarely seen in public since retiring from the entertainment industry in 2008, Gigi mostly focused on caring for her three daughters and managing her brother’s beauty clinic. Although busy with her new roles, Gigi still keeps in touch with her industry friends and cherishes these relationships. When good friends Yoyo Mung (蒙嘉慧) and Jerry Lamb (林曉峰) invited her to a special concert, Gigi initially told them she will consider attending but ultimately showed up and sat for the entire show. The concert was headlined by Jerry, Ekin Cheng (鄭伊健), Jordan Chan (陳小春), Chin Ka-lok (錢嘉樂), and Michael Tse (謝天華), the main cast members of the popular Young and Dangerous <古惑仔> movie franchise. The five performed many songs from the films as well as from their personal repertoire, exuding youthful energy and exchanged many jokes throughout the set. They also dedicated several songs to their wives, who enjoyed the show alongside Gigi. Gigi Lai looked very pretty in the above photo. I am glad to see Gigi’s news. Gigi still looks beautiful, young, and fit as a mother of 3 kids. Very humble and courteous for her to attend the concert. What happen to the other guy? I have been always wondering what happen to the muscular guy from young and dangerous he was in the 5 with Ekin before Chin Ka-lok came in the last 2 movies. I don’t know who you’re talking about. Maybe he’s busy or he didn’t get an invite, lol Ekin, Jordan, Michael, Jerry and CKL are close friends offscreen. So, perhaps they wanted to keep it just within the group. the 2nd guy to the right from this picture with the bat and has hair like Ekin in this picture. Jason Chu 朱永棠, who I believe has been away from the industry for many many years. Probably couldn’t make it, but he appeared to have attended Jason Chan’s wedding in Vegas. Oh so he is not in the industry any more. I wonder why he left? They make good money when you have a concert. Wow it’s great she attended the concert, she rarely spoke of the Y&D movies after appearing in them but it was one of her memorable roles and probably the role she was most known for, she was great in the movie it was quite tragic about her ending. Is Jerry Lamb’s wife the one who took the pictures or is she sat far apart from the wives? Jerry’s wife, Lily, was part of the chrorus group. I saw pics of her near the band and stuffs. Unfortunately, Jason Chan did not attend the concert.. yeah, same with Joanne, I have same question as well. Gigi looks aged a bit but still looks classy. Because she is not as young as you think she is. She looks great for her age. Yes she still looks great for her age except her forehead shows a little bald that’s natural for aging sign. Did gigi marry that cripple. ekin cried when he saw gigi,i never thought he have such a feeling for her,hope yoyo wouldnt be jealous,lol. I think it wasn’t a love kind of thing. more like seeing an old friend or family member kinda joy. 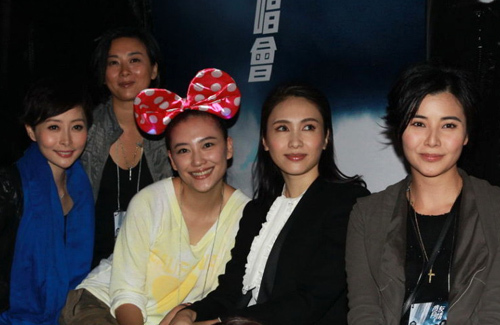 Why not they invited other origin cast like Francis Ng ?and Antony Wong chau sang ? exactly, I was thinking they would do more of a Y&D theme for old time sakes. Do a few comedy skits with Ugly Kwan coming back from the edad and Tai Fei being in it. They shoulda also did a Laughing Gor meets Ho Nam and boys. Instead we just got a concert with them singing songs. Ekin shoulda hollered at gigi, they were hot in Y&D. Gigi looks really great !